As one of the most commonly read online sources of medical information, Wikipedia is an influential public health platform. Its medical content, community, collaborations and challenges have been evolving since its creation in 2001, and engagement by the medical community is vital for ensuring its accuracy and completeness. Both the encyclopaedia’s internal metrics as well as external assessments of its quality indicate that its articles are highly variable, but improving. Although content can be edited by anyone, medical articles are primarily written by a core group of medical professionals. Diverse collaborative ventures have enhanced medical article quality and reach, and opportunities for partnerships are more available than ever. Nevertheless, Wikipedia’s medical content and community still face significant challenges, and a socioecological model is used to structure specific recommendations. We propose that the medical community should prioritise the accuracy of biomedical information in the world’s most consulted encyclopaedia. Why should medical professionals care about Wikipedia? Wikipedia is one of the most commonly read online sources of medical information, and is consistently among the top 10 most visited websites in the world (currently fifth).1 As well as being widely read by the general public, it is also used as a source of healthcare information by 50%–70% of physicians2 and over 90% of medical students.3 It is additionally used by educators, policymakers and journalists.4–6 Since the public relies on free online medical information for making health decisions, the accuracy and coverage of Wikipedia’s medical information have an immediate real-world impact on public health.7 The medical community should therefore take responsibility for ensuring its accuracy as an influential health information platform. Wikipedia total size and editors. (A) Total number of articles in the encyclopaedia (all languages). (B) Total number of articles in the encyclopaedia (in English). (C) Total number of editors making >100 edits per month (in English). (D) The proportion of the top 10 most spoken languages (native + secondary) compared with the size of different language versions of Wikipedia, and usage on the internet as a whole. After initial exponential growth of key topics, the English Wikipedia has settled into a slower, linear growth, as more niche topics and current affairs are added. These articles are written and edited by a community of approximately 30 000 editors that make >5 edits per month, and 3000 that make >100 edits per month. This number is down from its peak in 2007, when stricter content guidelines were introduced, but has remained stable over recent years, with a minor increase as easier writing and editing and tools are introduced (figure 1C). The size of the different language versions of Wikipedia is skewed towards English, although less in proportion to the internet as a whole (figure 1D). Common criticisms of Wikipedia include concerns over content quality, coverage, readability and vandalism. However, much has been done to make Wikipedia’s open editing system remarkably robust—from editor culture and policies (eg, increased focus on reliable references)12 13 to technological improvements (eg, automated software that reverts vandalism).14 This has been reflected by improvements in perceived accuracy by readers.15–17 As the encyclopaedia’s contents, editors and policies change over time, studies of it can quickly go out of date. This article therefore aims to give an overview of the past, present and possible future of Wikipedia’s medical content. Daily pageviews for medical topics. 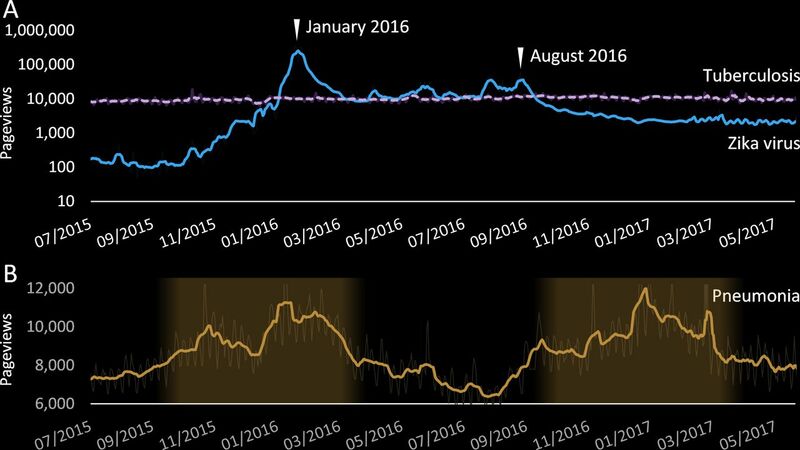 (A) Most pageviews are relatively stable (eg, tuberculosis), while some are highly dependent on world events (eg, Zika virus). (B) Some seasonal illnesses vary cyclically (eg, pneumonia) by the seasons of the Northern Hemisphere, where approximately 90% of people live. All points smoothed by a 7-day moving average. Wikipedia articles are rated by importance and quality by the communities of editors (online supplementary tables S1 and S2). Top-importance articles include conditions of global significance, such as tuberculosis and pneumonia. High-importance includes common diseases and treatments. Mid-importance encompasses conditions, tests, drugs, anatomy and symptoms. The remaining low-importance articles include niche or peripheral medical topics such as laws, physicians and rare conditions. Articles are similarly rated for quality on a scale ‘Stub’, ‘Start’, ‘C’, ‘B’, ‘Good Article’ (GA) and ‘Featured Article’ (FA). The latter two categories are only assigned after an internal peer review process.20 GAs comprise 0.7% of medical articles and require a single peer reviewer (figure 3A,B). FAs comprise 0.2% of medical articles and have to pass more stringent criteria and often have 5–10 reviewers. A summary of article quality across all articles in Wikipedia. Articles are assigned quality and importance rankings. ‘Featured article’ (FA) and ‘Good article’ (GA) are assigned by internal peer review. (A) Total number of medical articles of each quality ranking. (B) Percentage of medical articles at each quality ranking, separated by article importance (excluding unassessed). (C) The total number of medical articles (FA+GA) over time. (D) Overall number of all articles of each quality ranking Wikipedia-wide. (E) Overall percentage of all articles at each quality ranking, separated by articles importance (excluding unassessed) Wikipedia-wide. (F) A comparison between the overall rankings (dashed line) and those of medical articles (blue line). B, ‘B-class article’; C, ‘C-class article’. The quality ratings of medical articles are well above Wikipedia’s average (figure 3D–F). 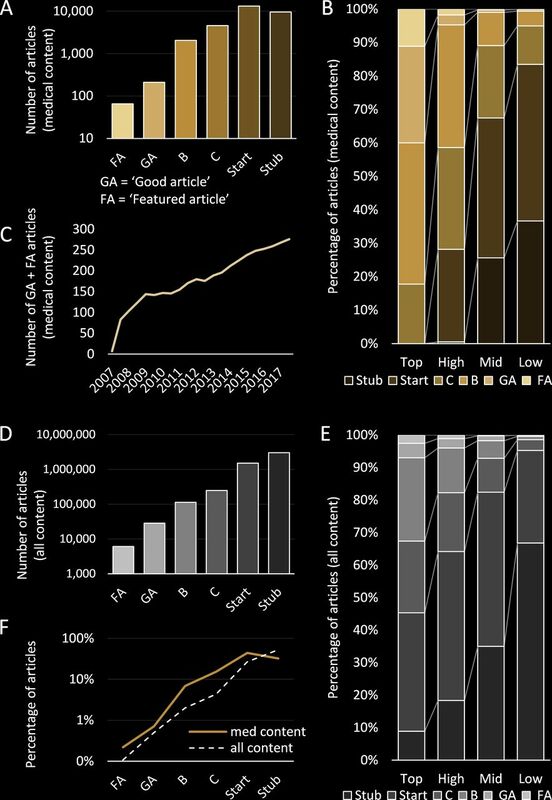 In particular, 83% of the top-importance medical articles are of ‘B-class’ quality or above (only 30% Wikipedia-wide) and <1% of the top-importance and high-importance articles remain ‘Stub-class’ (25% Wikipedia-wide) (figure 3B,E). Over 270 medical articles have been promoted to GA and FA, with around 20 more passing review each year (figure 3C). External assessment of Wikipedia’s overall content quality was found to be comparable to Encyclopaedia Britannica over a decade ago.21 Comparisons of its medical content with other sources vary for specific subjects, such as pharmacology, psychology or oncology22–24; however, some general conclusions can be drawn. Wikipedia’s medical content frequently suffers from low readability and errors of omission, despite the fact that included content is relatively high quality and well referenced.12 Errors are typically not due to deliberate vandalisation or underqualified editors,25 but rather that the volunteer editor base is relatively small and so topics are unevenly covered. 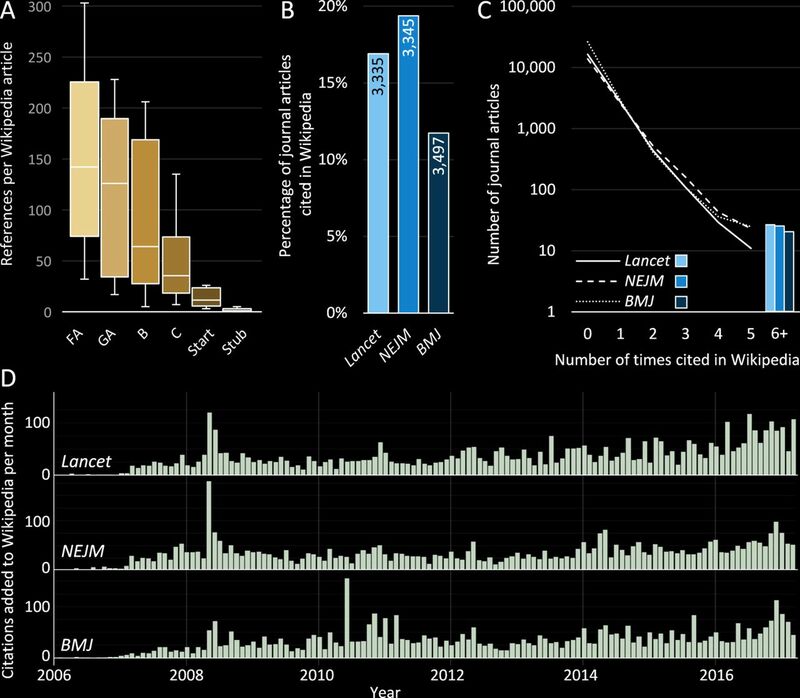 Improved referencing for Wikipedia’s medical articles has been a strong focus since 2007.26 Higher quality articles often cite more than a hundred references (figure 4). The majority of references for Wikipedia’s medical articles are drawn from reliable sources.22 27 Furthermore, secondary and tertiary sources (eg, meta-analyses and clinical guidelines) are strongly preferred in order to reflect the accepted medical consensus.28 Examples from three leading medical journals (The Lancet, New England Journal of Medicine and British Medical Journal) show similar trends, with a high percentage of articles cited by at least one Wikipedia article, and a subset of publications cited multiple times (following a power law). Citation metrics for medical content. (A) Total number of external references per Wikipedia medical article for different article qualities (n=10). FA, ‘Featured article’; GA, ‘Good article’; B, ‘B-class article’; C, ‘C-class article’. (B) Absolute numbers and percentage of scholarly articles from three representative high-impact medical journals that have been cited in Wikipedia (up to 13 January 2017). (C) Number of times articles from each representative medical journal have been cited in Wikipedia. (D) Dates when articles are first cited by Wikipedia from selected journals. Lancet, The Lancet; NEJM, New England Journal of Medicine; BMJ, British Medical Journal. Wikipedia editor communities are organised into approximately 800 currently active ‘WikiProjects’, which bring together editors interested in a particular topic or process in Wikipedia (online supplementary table S3).29 WikiProject Medicine was one of the first such communities, being founded in 2004 by Jacob de Wolff, MD. It is also one of the most active (consistently in the top 10, online supplementary figure S1) with 130 participants on its discussion forum in any given 90-day window, and a further 700 contributors who edit articles within its scope.30 The community’s overall size has remained relatively constant since 2013. These are largely a mixture of health professionals, researchers and students with an interest in freely available, accurate medical information.25 Discussion of improvements to content is typically held both at the WikiProject’s central discussion page30 and on the discussion pages for individual articles.31 The community has since expanded to form the Wiki Project Med Foundation, in 2012, a non-profit corporation working to promote the broader development and distribution of Wikipedia-related medical content. 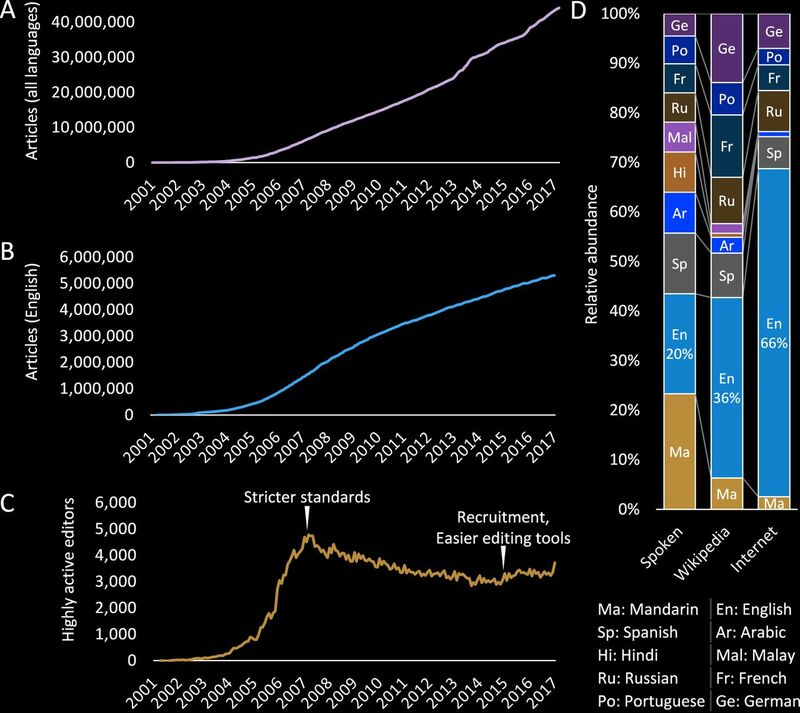 One of the largest changes in Wikipedia over recent years has been an increasing number of collaborations between the encyclopaedia and the wider biomedical community (figure 5).32 Dozens of academic publishers, medical institutes and universities have formed temporary and extended partnerships. These benefit the encyclopaedia by providing and improving content, and benefit the partner organisations by increasing impact and awareness as a result of Wikipedia’s readership. Collaborations between Wikipedia’s medical community and outside partners. 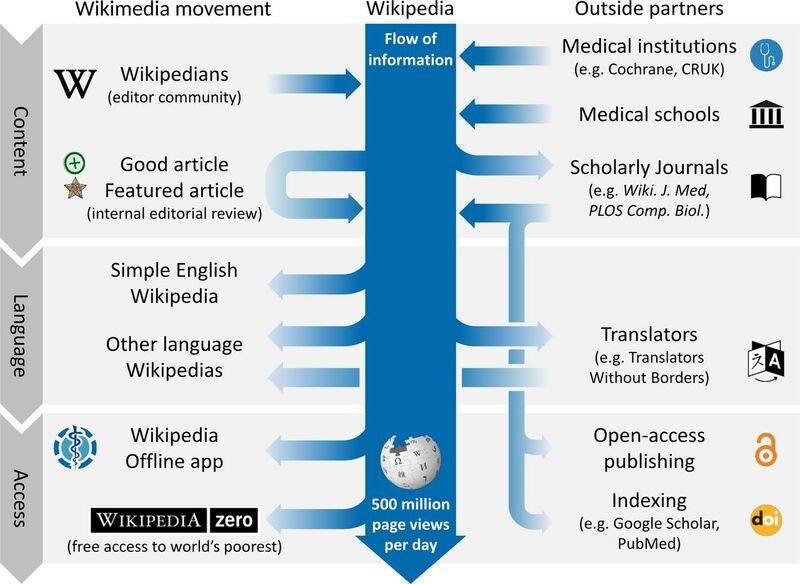 An outline of collaborations and interactions between the WikiProject Medicine community, institutions, schools, journals and translators (adapted from reference Shafee et al).32 CRUK, Cancer Research UK; PLOS Comp Biol, PLOS Computation Biology; Wiki J Med, WikiJournal of Medicine. Translation and distribution collaborations increase the impact of content improvement efforts. Translators without Borders, a non-profit organisation, collaborates to translate important medical articles on Wikipedia for the non-English Wikipedias, so far resulting in more than 5.3 million words of translated text in over 100 languages.43 Several telecom operators in Africa, South East Asia and the Middle East waive data fees for Wikipedia access (Wikipedia Zero), and free mobile apps allow offline storage of Wikipedia medical content for those without reliable internet access.44 The success of such ventures is highlighted by the 2014 Ebola outbreak. During the early part of the outbreak, teams overhauled the English-language articles on Ebola, and translated them into more than 100 languages. This content was viewed at least 89 million times in 2014 (at a conservative estimate) and was likely the most used online source for Ebola information in each of the four most affected countries. Overall, these diverse initiatives add and disseminate high-quality content, as well as introduce Wikipedia editing to people who otherwise would not have contributed. Given Wikipedia’s importance as a source of information, it is crucial that it is continually improved and updated. Despite its successes, significant challenges remain to be overcome (table 1). Errors and omissions need to be reduced and language often needs to be simplified.23 45 Content is still heavily skewed towards English. Editor numbers are still insufficient to support expertise on the diversity of specialist topics, and a wider demographic of contributors needs to be recruited.46 The encyclopaedia norms and bureaucracy need to be simpler and clearer to reduce negative experiences for new editors and to better interface with partner organisations.47 In general, the rewards for contributing need to justify the time commitment for expert contributors. The initiatives described in the previous section show how engagement by other organisations can bolster the efforts of Wikipedia’s established community of medical content editors. Improved content also generates a positive feedback cycle of increased editing.48 The WMF is currently developing a strategic plan for the coming 15 years for Wikipedia and its sister projects.49 In this section, we therefore describe recommendations for established Wikipedia contributors, as well as the medical, research and publishing communities. The backbone of Wikipedia is the individual contributions of volunteers. Individual attitudes, behaviours and knowledge consequently have a strong impact. Medical organisations are already adapting to recognise the diverse ways in which members contribute to public health. The increasingly common Altmetric score includes Wikipedia as one of the indicators of societal impact for academic publications.59 Recognition and support for Wikipedia content contributions will similarly impact whether experts are able to prioritise engagement in improving Wikipedia. Simplifying Wikipedia interfaces can increase article generation by reducing barriers to the technical requirements of contributing to an online encyclopaedia. Reducing complexity and increasing automation of common tasks allow editors to concentrate on content. Additionally, consolidating rules and guidelines will lower barriers for medical practitioners and academics to join or interact with the Wikipedia community. The editing technology, interface and workflow influence who is able to contribute and so influence editor diversity.46 For example, making it easier for interested editors to find articles that would benefit from translation will help reduce the English-language bias.60 Automatic feedback on readability of added content can similarly support improved writing. The increasing worldwide internet access, particularly on mobile devices, will further increase use of Wikipedia by academics and medical practitioners less experienced in the technological skills. Further development of tools for non-expert editors will enhance contributions and grow the editor community. The collaborative efforts of medical institutions and Wikipedia are vital to support expert contributors.44 Wikipedia’s relatively extreme egalitarian, open-access and transparent systems can clash with the established norms of medical institutions. Wikipedia’s policies and guidelines have become increasingly complex and very different from those that new editors or partner organisations are accustomed to.47 For example, Wikipedia’s protections for anonymity are unusual to a profession where accountability and verified expertise are the norm. Partner organisations have to work out how to interact with Wikipedia systems. Conversely, the Wikipedia community needs to support this by consolidating its policies and guidelines. This will allow new users to avoid accidental errors while they learn the nuances of Wikipedia contribution, and help organisations work out compatible partnerships. Successful models already exist on how to achieve productive collaborations, as discussed in the previous section, and we posit that the public health outcomes are worth the effort. Wikipedia is set to retain its position as a key public health information source. Its content, community, collaboration and challenges have been constantly evolving since it was established in 2001. Proposed socioecological recommendations are most successful when compounded. Many of these issues also involve positive feedback effects; for example, better representation of female editors encourages more to join, and improvement of Wikipedia’s reputation encourages expert contribution. Now is a particular period of change as the WMF is currently soliciting feedback to help shape its strategic plan through to 2030. Opportunities for the medical community to shape the encyclopaedia’s future stem from individual engagement with its ‘anyone can edit’ model, and increasing partnerships with the wider medical ecosystem. The medical community must work together to ensure that medical content is accurate in the world’s most consulted encyclopaedia. Wikipedia is one of the most used medical information resources globally, with immediate public health implications. Its model of user-generated content presents unique challenges and opportunities. Its content quality is variable but improving, and in need of further expert input. We summarise the major trends in how Wikipedia’s medical content, community and collaborations have changed since its inception in 2001. We raise specific proposals for both the Wikipedia community and medical institutions to help improve the encyclopaedia.
. How teachers are using technology at home and in their classrooms. PEW research 2013 http://www.pewinternet.org/2013/02/28/how-teachers-are-using-technology-at-home-and-in-their-classrooms/ (accessed 8 Apr 2017).
. Wikipedia’s medical content: a new era of collaboration. Wikimedia Blog 2016 https://blog.wikimedia.org/2016/10/29/wikipedia-medical-content/ (accessed 11 Jan 2017).
. Cochrane Community . Wikipedia: an important dissemination tool for Cochrane. 2017 http://community.cochrane.org/news/wikipedia-important-dissemination-tool-cochrane (accessed 19 May 2017).
. WikiProject CRUK Final report. Cancer Research UK, 2015. https://en.wikipedia.org/wiki/Wikipedia:WikiProject_CRUK/Final_report_2014-15 (accessed 19 May 2017).
. Continuing to bridge the journal-wikipedia gap: introducing topic pages for PLOS genetics. PLOS Biologue 2017 http://blogs.plos.org/biologue/2017/04/12/continuing-to-bridge-the-journal-wikipedia-gap-introducing-topic-pages-for-plos-genetics/ (accessed 17 May 2017).
. Modern medicine comes online: How putting Wikipedia articles through a medical journal’s traditional process can put free, reliable information into as many hands as possible. Open Med 2014;8:e116–9.
. Translators fight the fatal effects of the language gap. The Guardian, 2012. http://www.theguardian.com/global-development/poverty-matters/2012/apr/11/volunteers-translation-language-health-messages (accessed 22 May 2017). Wikipedia Zero. Wikimedia Foundation. https://wikimediafoundation.org/w/index.php?title=Wikipedia_Zero&oldid=107138 (accessed 7 Jul 2017). Wikimedia Strategy development (Cycle 2). meta.wikimedia.org https://meta.wikimedia.org/wiki/Strategy/Wikimedia_movement/2017/Cycle_2 (accessed 11 May 2017). Keystones to foster inclusive Knowledge Societies. Unesco 4 March, 2015. http://www.unesco.org/new/fileadmin/MULTIMEDIA/HQ/CI/CI/pdf/internet_draft_study.pdf (accessed 17 May 2017). Contributors TS gathered and analysed data for the figures. GM contributed to analysis for figure 4. All authors (TS, GM, LK, DD, MH, JH) discussed the material, wrote the manuscript, and approved the final version. Funding The work is not externally funded. The article processing fee was covered by a rapid grant from the Wikimedia Foundation. The Foundation had no involvement in the study design, the collection, analysis and interpretation of the data, writing the report, or in the decision to submit the manuscript for publication. Competing interests All authors have contributed to Wikipedia articles. TS, DD, MH and JH are current participants in WP:MED. JH is a former and current member of the Wikimedia Foundation board of trustees. All authors are on the editorial board of WikiJournal of Medicine. TS is on the editorial board of PLOS Genetics. The authors do not receive financial compensation for their contributions to these projects.